Last year, Memoir of a Murderer dominated the South Korean box office and became the first Korean thriller of 2017 to surpass two million ticket sales. As an obvious commercial hit, I’d tagged this on my “to-watch” list, intent on discovering just what was so good about the film that kept the crowds coming to see it. And I have to say, having finally sat down to watch the movie nearly a year after its initial release date, I’m still wondering. An accident of unknown circumstances occurring seventeen years ago has left Byeong Soo with traumatic head injury-induced dementia that is slowly causing him to lose his memories. In a desperate attempt to recall these events that are slowly slipping away from him, he keeps a detailed journal of his life – and his past crimes as a vigilante murderer – to remind himself of his past. 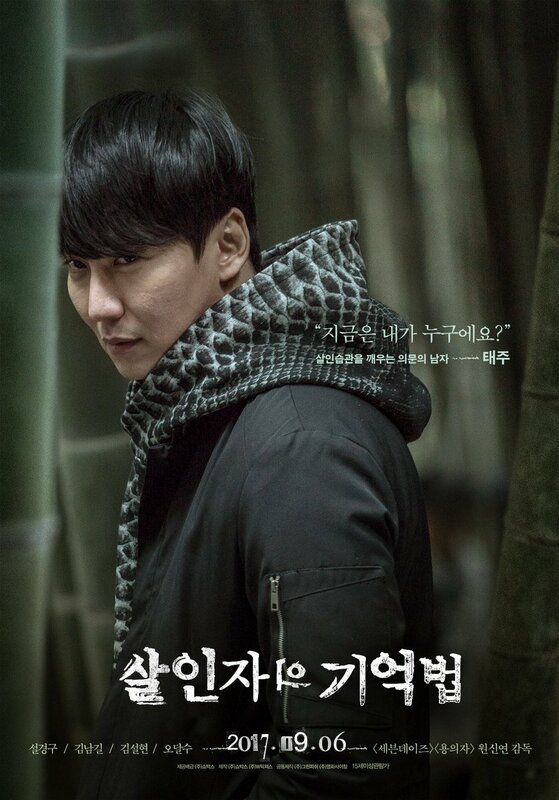 However, when a local series of murders begin once more and Byeong Soo becomes convinced he knows the culprit, he must race against his own rapidly diminishing grasp on reality to stop the murderer before his daughter Eun Hee becomes his next target. I may have gone into Memoir of a Murderer with my expectations set a little too high, given the hype surrounding the film. Because, ultimately, I came away from it feeling more underwhelmed than anything else. And while I don’t think a work of fiction has to be groundbreaking in its genre to be enjoyable, Memoir of a Murderer felt a little too textbook psychological thriller to me. None of the twists shocked me, the climax of the movie dragged, and the ending – which was clearly meant to be some earth-shattering revelation – felt like something I’d already seen before. So my review is coming from a place of optimism that ultimately failed me; I wanted to really enjoy this. Note: spoilers are ahead. Memoir of a Murderer is a difficult film to discuss without revealing some vital aspects of the plot and characters, so you’ve been warned. I’m going to make the general disclaimer that thrillers are some of my favorite movies to watch. And while I wouldn’t consider myself a refined connoisseur of this type of media by any means, I feel that I have some understanding of what makes a compelling one to watch. Keeping an audience in the dark, for example, before important reveals. Or maybe planting a story that is just predictable enough that the climax of the film and ending reveal leave the audience in varying degrees of shock. Memoir of a Murderer, unfortunately, does none of these things. I just felt like I’d seen it all before: a man with dementia struggling to remember a crime, a murderer masquerading as the opposite in a law enforcement unit, a kidnapped daughter. And while all of these tropes can and have been rehashed in a number of inventive ways for years, I can’t say this film delivered on this. The very moment it was established there was a local serial killer targeting young women, it was obvious Byeong Soo’s daughter would eventually become a target. 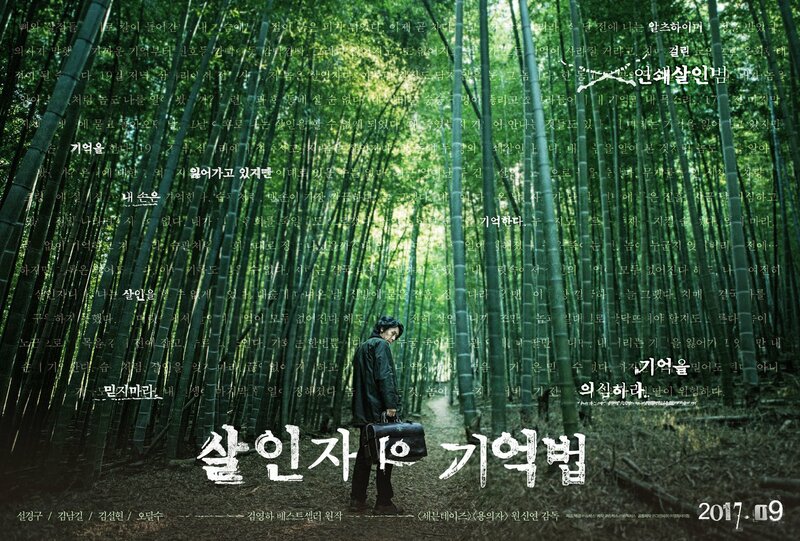 All subsequent reveals in the film, such as the various ways Byeong Soo’s dementia warped his perception of the world around him felt equally as predictable. That made the pacing for a good three-quarters of the drama rather plodding because I was ultimately just waiting for the eventual showdown between Byeong Soo and the serial killer Tae Joo. Everything preceding that felt moot because it was so clear where the plot was heading to. I’m going to address the ending “twist,” because I feel like this conclusion is what a lot of people were probably buzzing about after the film’s release. I can’t really speak for how this ending came off in the original novel format, but it felt like such a cop-out to me – and a confusing one at that. If the climax of the film was indeed a hallucination on Byeong Soo’s part and Tae Joo remains a serial killer at large, it makes the final quarter of the film not only pointless, but outright impossible. There’s really no plausible explanation for how Tae Joo could have escaped, nor is there really an explanation for how Byeong Soo might have overpowered him enough to even chase him off, let alone kill him as was explicitly shown in the film. I just don’t see an outcome to these events making sense in any universe dreamed up by Byeong Soo’s dementia. And that’s why, rather than really feeling cheated by the ending, I felt like I just watched a writer say, “Look, I’m clever!” when they were simply bending the laws of a plausible reality. The conclusion seems to imply Byeong Soo will stop at nothing to eventually hunt down this murderer when all the previous events of the film showed us that this is probably just a rare moment of clarity in his Alzheimer’s and nothing will eventually come of this declaration. I’ve seen elderly people suffer from Alzheimer’s. It’s heartbreaking to watch and in the context of this film, not a condition that leaves its victim able-bodied or cognizant enough to wage a vendetta against someone. Thus, it’s hard for me to look on Memoir of a Murderers’ ending in a positive light, in both a narrative sense and the message it was sending about dementia. The characters, in my opinion, feel like the weakest part of the entire film. They came across to me as a means to move the plot along more than any real human beings we as the audience were supposed to connect with, root for, or even dislike. I felt mostly ambivalent about the fairly minimal cast of characters because none of them were particularly fleshed out, and the primary antagonist especially lacked nuance. I’m only going to focus on the three main characters – Byeong Soo, Eun Hee, and Tae Joo – because everyone else is basically just cannon fodder. Kim Byeong Soo is our protagonist, put very loosely, because his character falls into the morally gray spectrum that his definitely leaning more towards black given his past crimes. I personally adore characters with very dubious morality because it feels incredibly human, and they are usually unpredictable. Byeong Soo, unfortunately, isn’t quite sympathetic enough to relate to even with the history of his murders being centered around individuals he deemed morally bereft enough to deserve to die. He’s no Light Yagami though, and the only truly unique twist on this type of character is that Byeong Soo suffers from dementia, making him an incredibly unreliable narrator. Byeong Soo’s daughter Eun Hee is the very predictable damsel in distress of the story. She exists solely so that Byeong Soo and Tae Joo have a reason to square off in a serial killer battle of wits and brawn, and that’s fine. But it didn’t really endear me to her as a character because she was just the archetype of the loyal, naive daughter that underwent no kind of development as the story progressed. The most interesting aspect of her character was the change in her relationship with her father Byeong Soo after they both learn she is not biologically related to him, which is something I admit I didn’t anticipate. But this mild surprise was followed by the terribly obvious twist the director tried to play up with Byeong Soo being the cause of his wife’s disappearance after he murdered her in cold blood. Roll credits, I guess. And now we move onto Tae Joo, the blandest serial killer if I ever did see one. His backstory comes to us in the form of a monologue during the rising action for the final showdown of murderers, and that was just lazy writing to me. Films are the primary place to utilize the “show, don’t tell” methodology of weaving a compelling story and Memoir of a Murderer could have certainly benefited from utilizing that more. What’s worse about Tae Joo is that a murderer who targets women out of repressed negative feelings for his mother is a hopelessly generic backstory for a serial killer. Altogether, he’s a C- villain for me and I probably will forget him as quickly as Byeong Soo did after their first fateful meeting. The performance of the ensemble cast was easily the highlight of Memoir of a Murderer. For all my criticisms of the actual events of the film, I am at least happy to say that I have nothing but praise for the acting showcased. 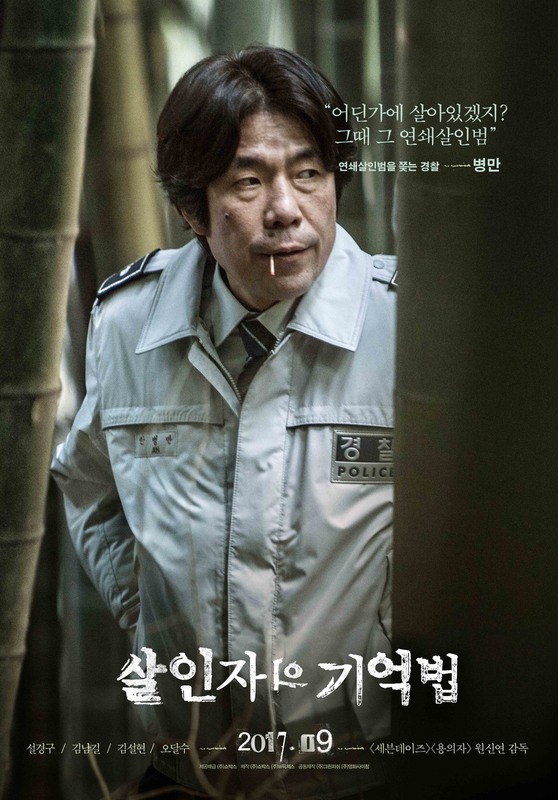 Sol Kyung Gu has a prolific and highly acclaimed career as an actor in South Korea, and his experience shows in his performance in Memoir of a Murderer. He was able to alternate between the emotional highs and lows that a character suffering from dementia needed to convey. Kyung Gu also had a very convincing tick that he used to portray moments when Byeong Soo was slipping into one of the episodes where he loses his grasp on reality that I found impressive. All in all, Kyung Gu didn’t really endear me to his character but he certainly was able to show the image of a character with conflicting motivations, and a complete lack of reliability as a narrative perspective. The only distracting thing about his performance was my fixation on trying to determine if he was wearing a wig for most of the movie. But that’s admittedly irrespective of his performance. Questionable hair stylist choices aside, I’ll move on to the only female actress that had a major role in the film: AOA’s Kim Seolhyun. I know people are often skeptical of idols taking on roles in film and television. And I’ll admit my only other experience having seen Seolhyun act was in the drama Orange Marmalade, which was truly an uphill battle to prove herself as a competent actress. Memoir of a Murderer has a hugely different tone from any of her past works, however, and she stepped up to the challenge of taking on a much darker role beautifully. She was believable as the doting daughter and utterly compelling as the distraught woman who is forced to learn two terrible truths after being kidnapped and nearly murdered. Seolhyun definitely gets my props here, and I’m anticipating seeing her more serious roles after the well-deserved general acclaim she got for her performance as Eun Hee. Memoir of a Murderer is dark, and I mean that in both a thematic and visual sense. There is a very cool-toned gray cast over every scene that makes even the more light-hearted or even mundane scenes rather eerie and adds to the growing sense of foreboding as the movie progresses. The film is shot beautifully, actually, for how grim the progression of the plot is, and my only quip would be the way Byeong Soo and Tae Joo’s final fight was portrayed. There were certain moments in this needlessly long fist fight that were jarring to watch, not because of the events onscreen, but the rather odd transitions between the character’s movements. Having now seen the ending of the film I can’t say if this was poor editing or some reflection of Byeong Soo’s own warped perception of the event in his memory. So I suppose I’ll let it slide. Otherwise, the cinematography was another aspect of this film that was done very well and accentuated the strength of the performances as it should. Memoir of a Murderer does everything competently but nothing impressively, leaving me in a place of just mild ambivalence. While the pacing and lack of original plot devices bogged down the sequence of the plot, those interested in a morally gray unreliable narrator may want to stick out this thriller even with the lack of thrills it delivers.